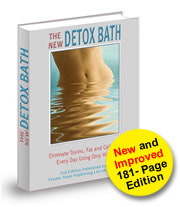 Detox Bath is based on a proven ancestral detox method created by Louis Kuhne od Leipzig in the 1880s. With regular practice, the Detox Bath will boost your health, metabolism, fitness and well being for a lifetime using only water. Discover how to eliminate toxins, fat and cellulite on a daily basis using only water. Detox Bath is based on an ancestral detox technique created by Louis Kuhne of Leipzig in the 1880s.